I've made this several times and its always comes out great - The only change I make is to thinly peel the lemons and add the peel to the sugar/water mixture on the stove, cooking for about 10-15 minutes. 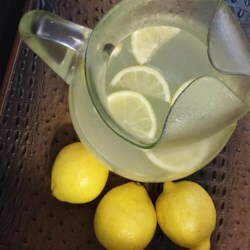 It adds extra lemon flavor and adds some lovely color to the lemonade. Make sure you strain out the cooked peels before mixing in the additional water.